I love seafood, especially when it comes to fish tacos. When I heard that we were invited to try out a fish shop in Hermosa Beach, boy, was I on it! 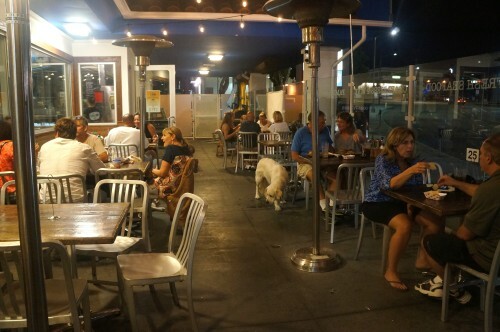 Opened in 2014, Hermosa Beach Fish Shop is an extension from their very popular sister shop in San Diego. The shop uses fresh fish and hand make their own seasonings and sauces. The place is casual, perfect for dining indoors or al fresco. The best part about this place (other than the food of course!)? They don't have a corkage fee so feel free to bring a wine bottle of your choice! The ordering is pretty simple. You pick your fish (and trust me, they have a variety of them). You pick your marinade. 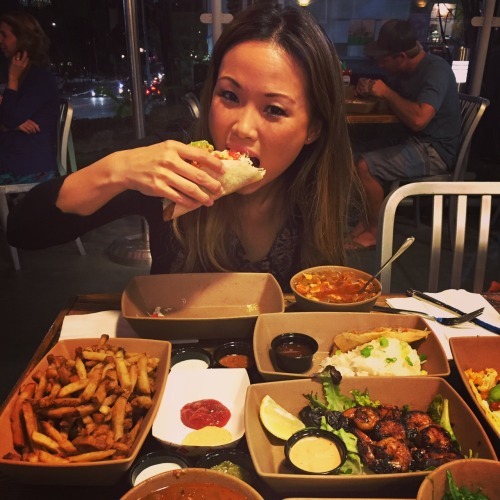 Finally, you choose your style which can range from a taco, a salad, a sandwich or a plate. They also have other fish dishes as well. And if you’re having trouble deciding, don’t worry! They offer some complimentary chips and salsa while you contemplate on your decision. 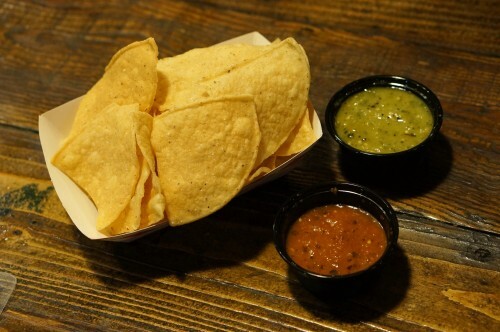 And let me tell you, their salsa is amaze-balls! 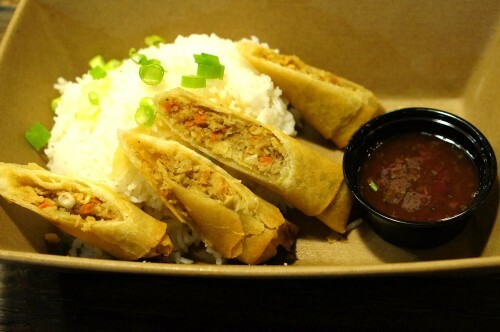 LOBSTER LUMPIA-fried lobster egg rolls served with jasmine rice and sesame sweet chili dipping sauce. These cute, little Filipino egg rolls were fried super crisp on the outside with a moist lobster filling on the inside. The dipping sauce wasn’t overly spicy and definitely complemented the lobster lumpia. 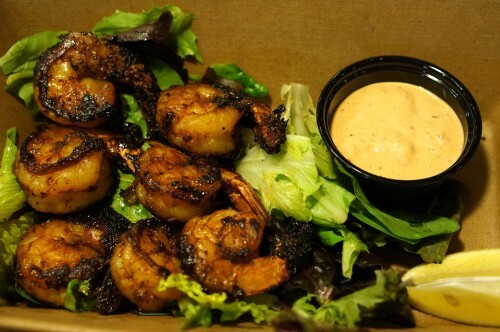 FISH SHOP SHRIMP-shrimp seasoned in Fish Shop seasoning, sauteed and served with a chipotle aioli dipping sauce. This was probably one of my favorite dishes of the night. The shrimp were succulent, with a slightly spicy, smokey flavor to it. The aioli was cooling to the taste. Together, it was a match made in heaven. 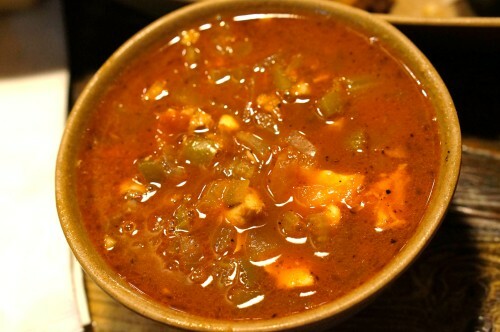 FISH SHOP STEW-chunks of fresh fish in a house made broth. When you want a soup that brings fresh fish as the highlight of the dish, then this is it. The broth is tomato based and the variety of fish in the stew is remarkable. TKO TACO-fresh Mahi Mahi grilled, your choice of flour or corn tortilla, marinated with our Fish Shop seasoning, shredded cabbage, mixed cheese, house white sauce topped with a tropical salsa with an added avocado. This was in contention for the best dish of the night. I thoroughly enjoyed this taco as it had a lot of flavor. The Mahi Mahi was flaky and the ingredients meshed well together. 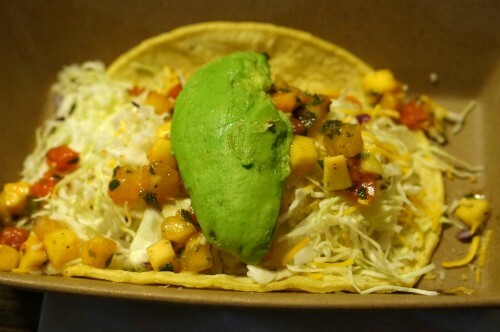 If you can’t decide on what to get, you can’t go wrong with this taco. FISH PLATE (grilled or fried)- Choice of 8oz fresh fish (we chose the Hawaiian Ono since it was their special) seasoned to your liking and grilled to perfection. 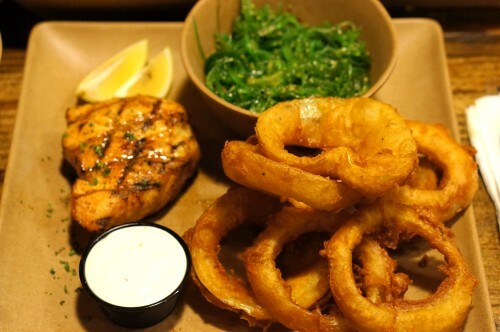 Your choice of two sides (we chose seaweed salad and house cut onion rings). If you want a complete meal, this is the way to go. The onion rings were crisp and the salad was refreshing. The fish itself was grilled and seasoned with the garlic butter and fish shop seasoning. Delicious. Hermosa Beach is very lucky to have something like this in their hood for some good, casual dining. The food is fresh and delicious. I appreciate the variety of fish the shop has to offer. The fact that Hermosa Beach Fish Shop is an expansion of their original shop in San Diego means that their doing something right. Just be careful with this place. 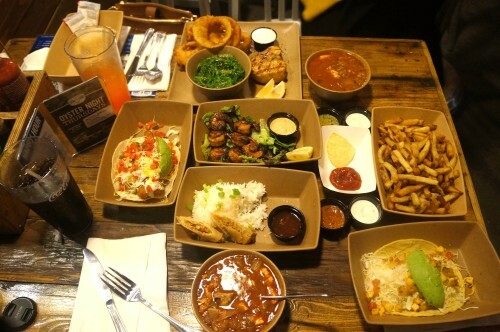 You could be like me and order outrageously amount of food! Don’t worry though…I can eat!